The popular quiz show existed in several incarnations on the radio, but its best-remembered version aired on NBC TV, where it was hosted for all 11 seasons by comedy legend Groucho Marx. The quiz format itself was fairly standard, but the charm of the show sprang from its iconic host. 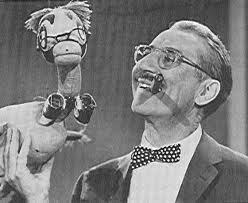 Groucho frequently improvised his patter with both the audience and the contestants, becoming so intrinsic to the show’s identity that it was renamed The Groucho Show in 1960. You Bet Your Life contained an element of surprise in the form of a “secret word,” a common word which, if spoken by a contestant, resulted in a $100 bonus prize. This prize was delivered by the show’s other signature element, a toy duck bearing Groucho’s famous features. Due to this running gag, contemporary meme historians credit Marx as the first American to “put a bird on it.” -A.D.
1969: Monty Python’s Flying Circus debuts. The British sketch comedy troupe—including Graham Chapman, John Cleese, Eric Idle, Terry Jones, Michael Palin, and Terry Gilliam—tackled the full gamut of comic stylings, from the wry to the absurd over four series on the BBC. 1970: The Public Broadcasting Service is founded. The most famous (and generally considered the most trusted) name in public television, PBS replaced National Education Television while retaining a focus on informative and culturally relevant content. 1999: Angel debuts on The WB. Spun off from creator Joss Whedon’s cult favorite Buffy the Vampire Slayer, the supernatural drama followed David Boreanaz’s titular “vampire with a soul” to Los Angeles where he and his crew fought evil for five seasons. Today’s Birthdays: Josie Bissett, Melrose Placer (42); Jeff Conaway, cabbie (d. 2011); Bill Dana, comic (88); Larry Fine, stooge (d. 1975); Bernie Mac, caretaker (d. 2008); Guy Pearce, neighbour (45); Donald Pleasence, playhouse vet (d. 1995); Neil deGrasse Tyson, space buff (54).